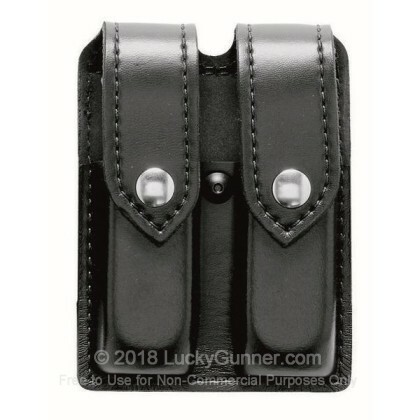 This magazine pouch from Safariland holds two Glock 19 or Glock 23 magazines on a standard 2.25 in (58mm) duty belt. The pouch uses sturdy yet flexible synthetic material with a matte finish and comes with black snap closures. Notable features of the Model 77 include horizontal and vertical belt loops that enable easy access or low profile mounting. In addition, the pouch's center-mounted adjustable tension screw allows the user to control how tightly the pouch retains the magazines, balancing retention and speed as needed.